The Greenwood 120 System is a career counseling and guidance tool that uses an online assessment to measure person’s abilities, interests, values, and personality, and matches that profile to a database of over 1000 jobs to find the best 10% matches. The system also depends on a trained counselor or advisor to help the person go through a self-exploration and career exploration process to narrow the list to the very best career matches for each individual. This comprehensive system provides objective data about an individual and his/her unique situation, which becomes the basis for developing a carefully designed plan of action. The Greenwood System 120 Personality and Career Matching Report gives you the information you need to make big life decisions about your education and future career directions. Helps students learn about themselves and identify their long-term career interests. Combines abilities, interests, values and personality to create a unique profile. Uses big data to compare profiles to over 1,000 jobs and finds the Top 100 Career Models! Greenwood Associates has conducted research that has shown the, “GS 120 to be, 85% effective with a 94.6% approval rating”*, the most reliable and valid career matching instrument available. Using the most up-to-date, reliable, and valid psychometric tests available, the GS120 produces a 26+ page report that details the four domains of Abilities, Interests, Values, and Personality. 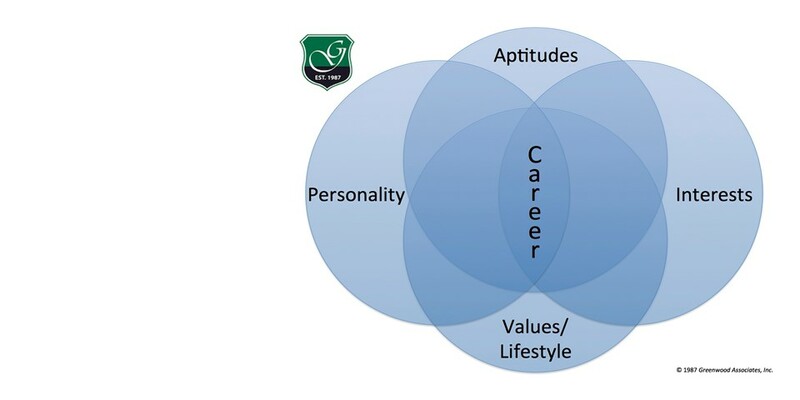 The intersection of all four of these domains is where the GS120 identifies the top 10% of all careers for each individual profile. Let the GS 120 help you find your path!